Does the Equation of Exchange Shed Any Light on the Crisis? HomeBusinessDoes the Equation of Exchange Shed Any Light on the Crisis? James Hamilton thinks the answer is no. In his reply to Scott Sumner’s lead article at Cato Unbound, he questions Sumner’s use of the identity MV = PY to explain the collapse of nominal spending over the past year. (In this equation M = money supply, V = velocity or the average number of times a unit of money is spent, P = price level, Y = real GDP, and PY = nominal GDP.) Hamilton contends the only meaningful use of the identity is to determine velocity (i.e. V=PY/M) and even then it is not totally reliable since it can vary based on the measure of money one uses. I believe, however, Hamilton under appreciates the insights this identity can shed on the crisis. It may not provide precise policy recommendations, but it does provide a starting point from which to think analytically and empirically about recent economic developments. 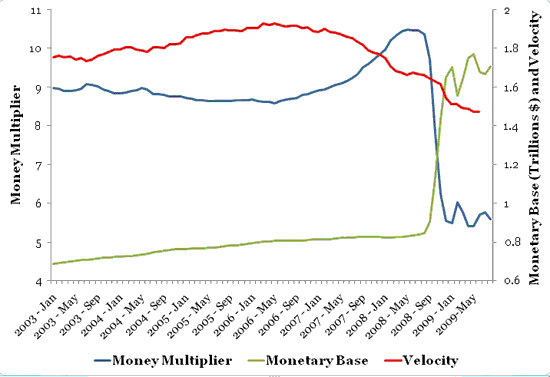 This figure indicates that declines in the money multiplier and velocity have both been pulling down nominal GDP. The decline in the money multiplier reflects (1) the problems in the banking system that have led to a decline in financial intermediation as well as (2) the interest the Fed is paying on excess bank reserves. The decline in the velocity is presumably the result of an increase in real money demand created by the uncertainty surrounding the recession. This figure also shows that the Federal Reserve has been significantly increasing the monetary base, which should, all else equal, put upward pressure on nominal spending. However, all else is not equal as the movements in the money multiplier and the monetary base appear to mostly offset each other. Therefore, it seems that on balance it has been the fall in velocity (i.e. the increase in real money demand) that has driven the collapse in nominal spending. This table confirms what we saw in the levels: a sharp decline in velocity appears to be the main contributor to the collapse in nominal spending in late 2008 and early 2009 as changes in the monetary base and the money multiplier largely offset each other. It is striking that the largest run ups in the monetary base occurred in the same quarters (2008:Q3, 2008:Q4) as the largest drops in the money multiplier. If the Fed’s payment on excess reserves were the main reason for the decline in the money multiplier and if the Fed used this new tool in order to allow for massive credit easing (i.e. buying up troubled assets and bringing down spreads) without inflation emerging, then the Fed’s timing was impeccable. Unfortunately, though, it appears the Fed was so focused on preventing its credit easing program from destabilizing the money supply that it overlooked, or least underestimated, developments with real money demand (i.e. velocity). As a consequence, nominal spending crashed. Now maybe this is self evident to some, but I find the above information from the equation of exchange useful as a starting point for discussing what went wrong and where to go from here. A Robust Recovery? How and Where? 1 Comment on Does the Equation of Exchange Shed Any Light on the Crisis?